lorn on How can this be allowed? 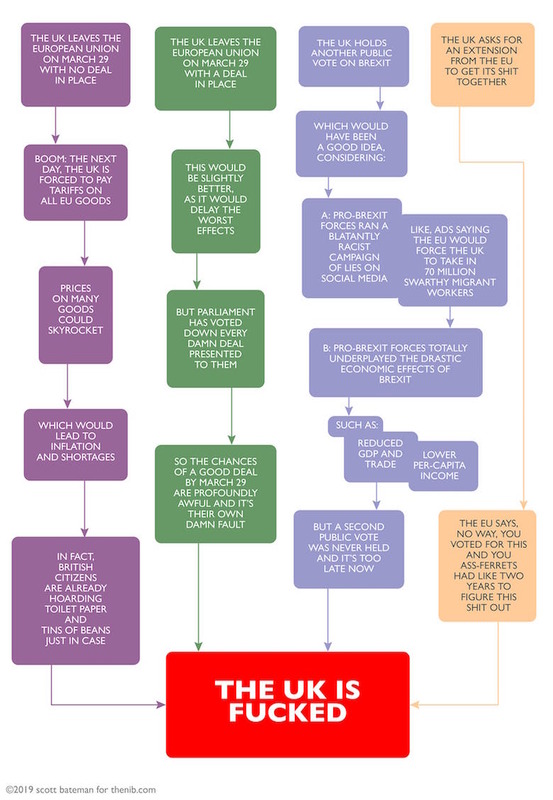 American cartoonist Scott Bateman tries to make sense of the state of affairs involving Brexit and prepared a handy flowchart to help people outside the UK understand the various options. Unfortunately, they all seem to lead to the same final result. I supported Beto O’Rourke when he ran for the Texas senate seat because when your opponent is Ted Cruz, you don’t really need a platform other than “I am not Ted Cruz”. But it has never been really clear what he stands for and so I am a little surprised that his announcement that he is running for the Democratic nomination for president is being taken so seriously. Seth Meyers looks at this and other issues. Samantha Bee lays out a convincing case for him having three titles to his name: racist, misogynist, and white nationalist. To those you can add homophobe. This Pearls Before Swine comic strip from two days ago seems apropos regarding my post from last week on how one’s attitudes change when one becomes old enough to die. He looks at this problem that has got so bad that I now never answer the phone if the number is unrecognized, though even there it is possible to be spoofed. How can we laugh at the absurd things that Donald Trump does, given that he is such a dangerous and despicable person? If you cannot see the embedded video, try here. Because if you do, he turns into something much more frightening than the Incredible Hulk. After showing that Blackadder clip a couple of days ago, YouTube (as is its wont) promoted another funny scene from the same show, this time about a famous theater superstition involving the play Macbeth. 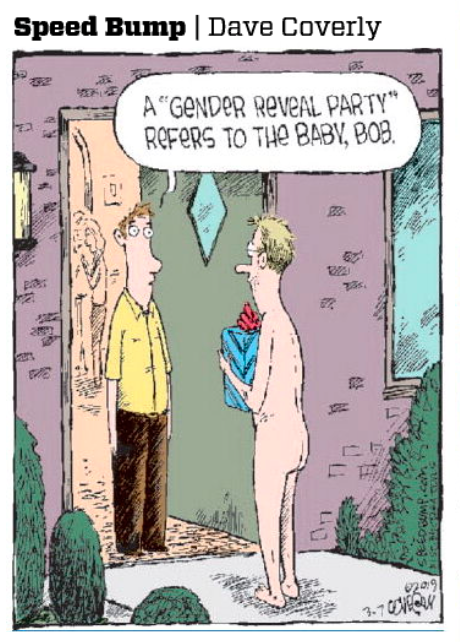 I am posting this cartoon by Dan Coverly because I found it to be funny but also because it emphasizes a point I made in an earlier post that for some reason the name ‘Bob’ seems to be funny and cartoonists seem to think that giving a doofus that name makes the joke funnier. And it does, at least for me, though I do not know why.